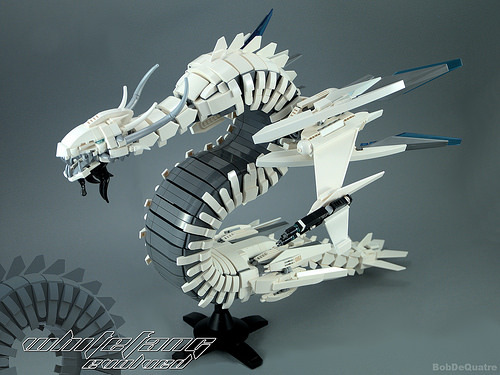 We highlighted BobDeQuatre’s amazingly cool white space dragon ship back in 2014, and it struck us as a highly unique concept executed remarkably well. In the intervening years, we haven’t seen much of the space dragons theme, but now Bob is back with an overhaul of the Whitefang. Now bigger and badder, the ship retains its basic structure and curved shaped based on the dragons of Eastern mythology, but loses the obvious cockpit in favor of a more organic look.